Family-friendly campsite 700m from the hot springs by the river with a heated pool. Free entertainment throughout the season. 2 holiday rentals, Felix and Pierre, available to rent on the campsite. Le Barutel is a leafy haven of peace by the Ardèche River where you can unwind and make friends. Heated pool, beach 80m away. Summer: shows, games and discos. Quiet and family-friendly campsite on the banks of the Ardèche with spacious and shaded pitches 1200m from the village. Pool, paddling pool, playground, summer entertainment, bar, restaurant, snack. Soak up the peaceful and friendly atmosphere at our little campsite in the shade of the acacias. Direct river access. Private beach to keep children and fishermen happy. Near to shops and spa resorts. Le Pont de Mercier campsite lies in lush countryside and welcomes you for an unforgettable holiday in the heart of this perfectly preserved region. 3-star family-friendly campsite on the banks of the Ardèche. Our USP: natural bathing area with private beach and waterfall. Leafy and spacious pitches. Premium rentals with 1, 2 or 3 bedrooms. Lots of options. Campsite in a lush and natural setting in the Lignon Valley, Family atmosphere. Swimming pool, paddling pool and fun games. Bouncy castles. New: premium bathroom facility. Available to rent: furnished rental sleeping 10-12. Shaded and quiet, surrounded by mountains for hiking and on the banks of a river for swimming and fishing. Family atmosphere. Family-friendly campsite in an iconic Ardèche mill setting deep in the mountains with a stream running through it near a village teeming with stone houses…and near the shops. Time stands still at L’Estival. Spending a holiday here is living the good life in the great outdoors with welcoming hosts. There are 20 shaded pitches with a swimming pool, outdoor relaxation area and playground. Riverside pitches and facilities in a leafy setting in the shade of the acacias deep in the Bourges Valley. 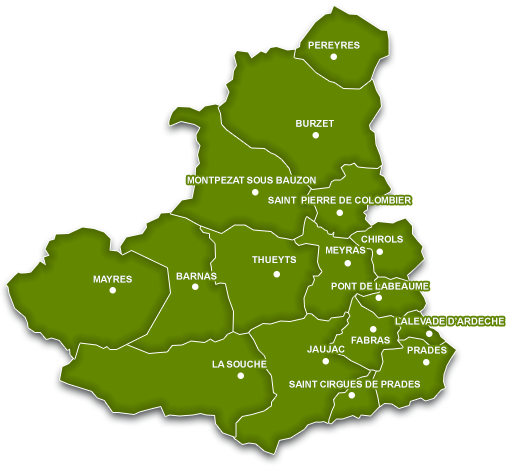 Burzet has been listed as a “green resort” since 2009 promoting its nature for holidays in the countryside. Shaded campsite on the banks of the Ardèche River. Trout fishing, hiking etc. Motorhome area.